The Pipettes are in danger of sharing the fate of so many '60s bands -- the ones who put out a remarkable album or EP, broke up, and then were forgotten within 10 years. 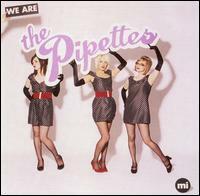 The U.K. edition of We Are the Pipettes was never issued here, so if you want the physical CD, you'll have to look for the import, and it will likely be hard to find. Mystifyingly, the album released in the U.S. was remixed by a pop producer who kind of missed the point. As I wrote in my review of that album, "It's counterintuitive that a band birthed from '60s nostalgia would benefit from a modernistic recording instead of one in the tradition of Phil Spector, which is what the British version follows." Although cursory listeners probably wouldn't notice much of a difference, the original edition sets the standard. Joy is alive here: every chime sparkling, every chorus brimming with enthusiasm. It's not all just harmonies, either: Listen to the way Gwenno, Rosay and RiotBecki interplay on "One Night Stand," structuring their vocals to ping-pong off one another, perfectly timed. The union of these talents lasted for but one album, with Rosay and RiotBecki moving on to other pursuits in 2008. At least they left us this memento.